Follow these steps to set up your BlackBerry device to use WPA2-E encrypted wireless at UCSD. An Active Directory (AD) username and password. Your username is usually the first part of your UCSD e-mail address (before the @ symbol). If you forgot your password, reset it at http://adpass.ucsd.edu. These instructions are based on the BlackBerry Bold. Configuration may vary depending on your model and cell phone service provider. 1. Scan for available wireless networks. 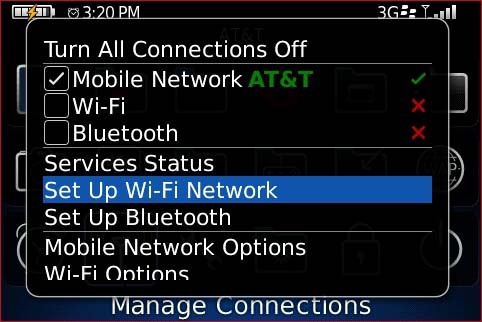 Select Set Up Wi-Fi Network. It may take a few minutes for your device to finish scanning for available networks. Once completed, select UCSD-PROTECTED. 2. Configure the Wi-Fi Security menu for UCSD-PROTECTED. User name: Enter your Active Directory (AD) username. User password: Enter your AD password. CA certificate: Select AddTrust External CA Root. Inner link Security: Select EAP-MS-CHAP v2. Token: Leave as None Selected. Once connected, select Yes for "Save this Wi-Fi Network as a Profile?" You are now connected to the UCSD-PROTECTED network. Wi-Fi can be left on. Your device will automatically connect when the network is in range.